Try this yummy vegetarian twist for Cinco de Mayo. 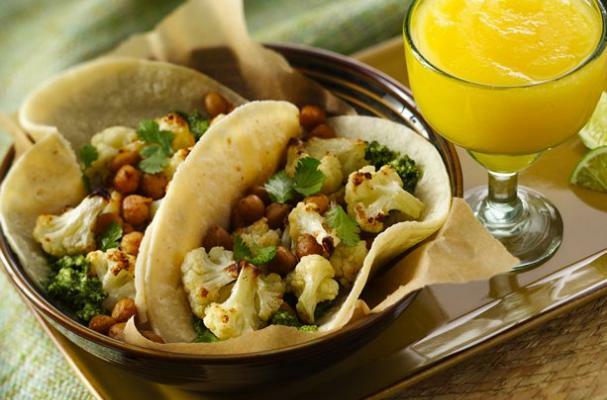 Meatless Tacos with roasted cauliflower, crisy chickpeas topped with a cilantro and pumpkin see pesto. Serve with a Mango Coconut Frozen Margarita and your party is off to a great start! Pour 1 1/2 cups coconut water into standard ice cube tray and freeze. In blender, add 3 oz blanco tequila, 1 oz clear orange-flavored liqueur, 1 oz fresh lime juice, 2 tablespoons light agave nectar and 1 1/2 cups chopped fresh mango. Cover; blend until smooth. Add coconut water ice cubes; blend until smooth. Pour into glasses; garnish with mango or lime slices. This entry was posted on Friday, May 4th, 2012 at 12:47 pm	and is filed under Cocktails, General Info, Ideas, Inspiration, Parties, Recipes. You can follow any responses to this entry through the RSS 2.0 feed. You can skip to the end and leave a response. Pinging is currently not allowed.